At Elite Motor Sports, we understand the importance of having a vehicle that provides us with the sort of performance that we need, as well as adding aftermarket parts to make it as efficient and effective as possible. We aim to be Woodland’s number one resource for tires, wheels, lift kits, powder coating, suspension systems and more. We want to provide you with the best service and products in Woodland, and we are passionate about making sure that you are completely satisfied with our work. Whether you’re in need of replacement tires or alignment services, we are here for you. To learn more about our products and services, contact Elite Motor Sports today! One of the many aftermarket parts that we offer Woodland truck owners are lift kits. While some people have a decent understanding of why one would want to lift their truck, others are not as familiar with the process. Today, we’ve decided to take a closer look at lift kits. 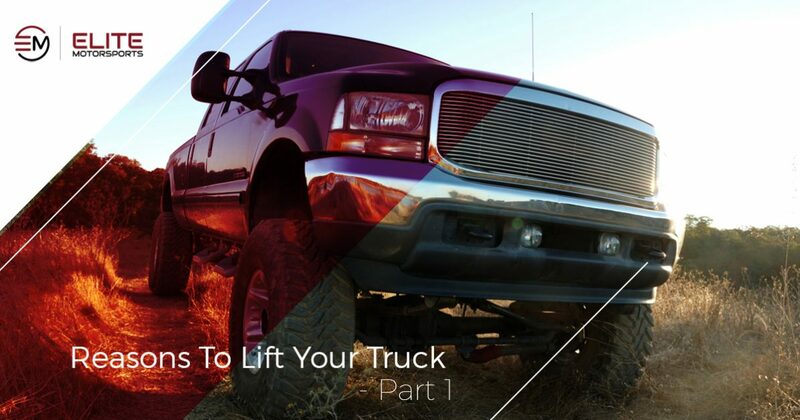 In part one of this blog series, we will look at a few reasons why you might want to lift your truck. Read on to discover more! It’s no secret that many truck owners love customizing their vehicles to suit their specific style and taste. Whether you’re the type of person that has a bumper sticker fetish or you prefer to go even further and alter your truck’s physical appearance, the desire to make something your own is a feeling that is incredibly common. To us, considering the amount of time that we spend in our vehicles each day, we understand why you want to customize your truck to fit your exact tastes and needs. With this in mind, lifting your truck is a great way to alter your truck’s appearance for the better. In terms of style, lifting your truck can very easily turn your truck from good to great. When you drive by pedestrians or stop at a red light, people will turn their heads and look at your truck, marveling at your stylish and imposing vehicle. Lifting your truck will give it a new aesthetic and sense of attitude. While most of us can agree that a lifted truck truly looks great, lifting your truck also comes with a variety of benefits as well. One of these has to do with your truck’s overall performance. If you own a truck, chances are you put it to good use, driving on a wide variety of terrains and hauling cargo. Whether you’re driving on a trail or in a construction zone, you’re bound to come across parts of your journey that are littered with obstacles. Whether you’re trying to climb hills, avoid debris in the road, or make sure that you don’t get stuck in uneven terrain, lifting your truck gives you additional ground clearance. This extra ground clearance will ensure that you will be able to easily navigate most any terrain, making the sometimes uncertain nature of all-terrain driving far more manageable. In addition to increasing your truck’s ground clearance, lifting your truck also increases your overall visibility. Being higher off the ground allows you to see more while you’re driving. This is incredibly important for all driving conditions, as it will make sure that you are more aware of your surroundings, the other drivers on your road, and any sort of obstacles that may lie ahead in the road. Not only will does lifting your truck increase your visibility, but it will also increase your safety by helping you be more aware of everything that is happening around you. Above are just a few reasons as to why you should lift your truck. Elite Motor Sports is proud to serve car and truck owners in the greater Woodland area with a wide variety of products and services, including truck lift kits, tires, wheels, suspension systems and more. We are here to provide you with the best customer service and products in Woodland, and we want nothing more than your complete satisfaction. We will conclude this series in part two, but until then, for all of your Woodland truck lift kit needs, contact Elite Motor Sports today.